The comedian took the stage for an unannounced 15-minute set late Sunday night at New York City's famed Comedy Cellar, nine months after his admission that he sexually assaulted women by masturbating in front of them. Comedy Cellar owner Noam Dworman, who wasn't in attendance, said the audience of about 115 people greeted him warmly with an ovation before his performance, according to his staffers and a tape he reviewed later. 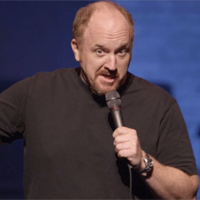 "It sounded just like he was trying to work out some new material, almost like any time of the last 10 years he would come in at the beginning of a new act," Dworman told The New York Times, adding that the jokes were “typical Louis C.K. stuff” — racism, waitresses tips, parades. Dworman said only one audience member complained the next day. "He wished he had known in advance, so he could’ve decided whether to have been there or not,” Dworman said. The Comedy Cellar owner said he welcomed CK's performance because “there can’t be a permanent life sentence on someone who does something wrong.” Still, Dworman said he was surprised CK would return to stand-up so soon. “I had thought that the first time he’d go on would be in a more controlled environment. But he decided to just rip the Band-Aid off.” he said.